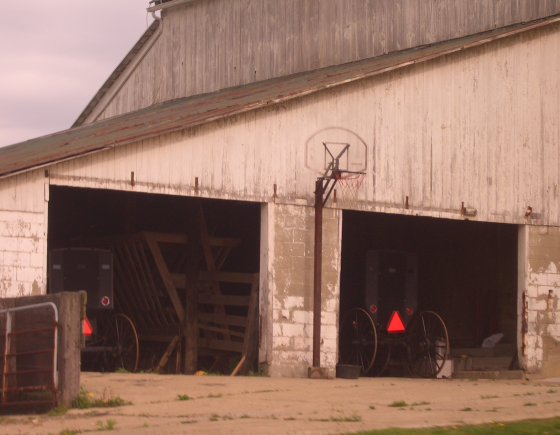 You frequently see basketball hoops in the Holmes County settlement, and in other Amish communities as well. As with many things Amish, there are different stances on the issue of sports—on what games are acceptable, who should play sports and when, and so on. If you’d like to read more check out this review of the Amish and sports. And: a pastime common among Lancaster Amish and Mennonites. Those basketball hoops are found where ever there is a cement pad on most Amish homes, providing the family has boys. My Amish friend says that they play a lot of volleyball. Is that also common in the Holmes county area?I’ve heard that many Amish dislike sports because thye promote competition and the like between people. I think sports are great ways to mold good character qualities! I should know! As the eldest of nine children (and we play a lot of volleyball) it’s a great time to practice good sportsmanship. A Daviess County Amishman once showed me an indoor basketball court he had built on his property. That was pretty unexpected. They apparently got a lot of use out of it. Abigail that may be part of the reason for some Amish objections to sports. There is a wide range of opinion on sports with different approaches seen in different communities or affiliations. There was an interesting look at this in an article in Family Life a while back. And yes, volleyball is quite common in Holmes County. I was wondering if you have the location of this basketball hoop. I just love it!